Rich in historical ethnic detail, Fiddler on the Roof has touched audiences around the world with its humour, warmth and honesty. Its universal theme of tradition cuts across barriers of race, class, nationality and religion, leaving audiences crying tears of laughter, joy and sadness. Based on stories by Sholem Aleichem, its celebrated score features songs loved the world over: Sunrise, Sunset, If I Were a Rich Man, Matchmaker and many others – it is simply Broadway at its very best! 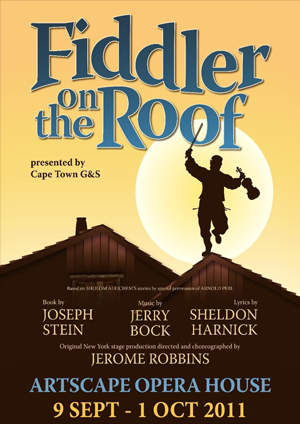 From 9 September 2011 and scheduled to run until 1 October 2011 at the Artscape Opera House, the Cape Town Gilbert and Sullivan Society and Teddy Davies (director) will bring you 21 performances of this very popular Broadway musical.